Central America is a region that is situated at the southern extremity of the North American continent. It comprises 7 nations, namely, Belize, Costa Rica, El Salvador, Guatemala, Honduras, Nicaragua, and Panama. 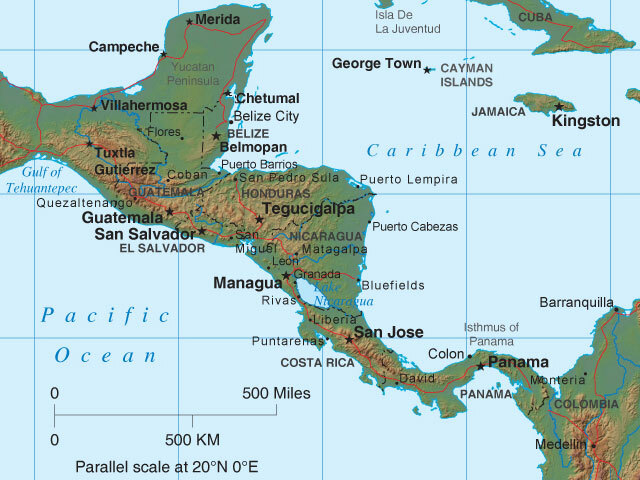 Geographically, Central America is an isthmus that joins the continents of North America and South America. To its west and south lies the Pacific Ocean; to its east and north lies the Caribbean Sea. This first map of Central America depicts the region's nations, capital cities, and other major cities as well as adjacent nations and bodies of water. This next Central America map is a terrain map that shows the region's major physical features, land forms, and bodies of water, as well as its countries, major cities, and highways. The table at right shows the capital cities, areas, and estimated populations (in 2016) of the seven Central American nations. Data is sourced from a World Bank dataset under a Creative Commons license. Belize, a constitutional monarchy, is located between Mexico and Guatemala, bordering the Caribbean Sea. Its terrain consists of a flat, swampy coastal plain, with low mountains in the south. The Republic of Costa Rica, or Republica de Costa Rica, lies between Nicaragua and Panama, bordering both the Pacific Ocean and the Caribbean Sea. Its two coastal plains are separated by rugged mountains, including several major volcanoes. The Republic of El Salvador, or Republica de El Salvador, is located between Guatemala and Honduras, along the Pacific Ocean coastline. Its terrain is mostly mountainous, with a narrow coastal plain and a central plateau. The Republic of Guatemala, or Republica de Guatemala, borders the Pacific Ocean between Mexico and El Salvador, and borders the Caribbean Sea between Belize and Honduras. Its mountainous interior yields to narrow plains along the coasts and a rolling interior plateau in the north. The Republic of Honduras, or Republica de Honduras, borders the Caribbean Sea between Guatemala and Nicaragua, and borders the Pacific Ocean between El Salvador and Nicaragua. Its terrain consists of a mountainous interior framed by narrow coastal plains. The Republic of Nicaragua, or Republica de Nicaragua, is located between Honduras and Costa Rica, with coastlines along the Caribbean Sea and the Pacific Ocean. Its extensive coastal plains along the Caribbean side yield to mountains in the northwestern interior and a narrow coastal plain, dotted with volcanoes, along the Pacific Ocean. See also Nicaragua.com. The Republic of Panama, or Republica de Panama, is located between Costa Rica and Columbia, with Caribbean Sea and Pacific Ocean coastlines. Its terrain consists of rolling hills and plains along the coasts, with rugged mountains and upland plains in the interior. Caribbean Map - Caribbean Sea region map and travel information. Map Of Mexico - Mexico maps and travel destinations. Map Of North America - North American maps and travel information. Map Of South America - South American maps and travel information.